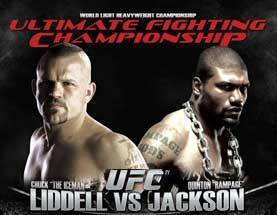 Let me set the record straight: I am a huge Lidell fan. I followed him way before his days of HBO guest appearances, back when he was just another UFC weirdo with a mohawk. His rise to fame was inevitable from both perspectives: 1) The UFC loves him because he is down to earth, articulate, and the type of fighter that people will pay to watch. He’s a guy who will knock his opponent out literally in the blink of an eye, and if he can’t do it that way, he’s still damn-well going to try. He won’t take his opponent to the ground and wrestle for 5 minutes even if he knows that’s his best chance to win. Instead, he’s going to stand and fight no matter what. 2) Fans love him for all the aforementioned reasons and a few more. As tough as he is, there are plenty of guys in the UFC who just look tougher and less like a guy you’d see out mowing the lawn. Now I know you and I would both do the same thing Johnny Drama did if it ever came to it, but be honest, doesn’t he look a lot like your average 3-day a week weightlifter? The guy is in incredible shape, and strong, but he’s no He-Man–if not for the mohawk, his looks and physique would get him into more bar-fights than they would help him avoid them. But in the ring Saturday night (or technically Sunday early morning), he just got caught. It could happen to the best fighter in the world, and some will say, it just did. He circled out of a left-hand and didn’t even see the overhand right coming from Jackson. He wasn’t out-quicked or out-toughed, but he was beat. Jackson quickly picked up the Clubber Lang-esque villain role after the fight almost guaranteeing an even higher grossing rematch. Some were disappointed with the quick ending, but I’ll take 50 seconds of guys going for a knockout over a 12-round sparring snooze-fest any day. If you enjoyed the De La Hoya – Mayweather patty-cake match, you would be disappointed after this fight, and you would be crazy.